The teaser trailer for the fifth installment of the Resident Evil film series has leaked online, so watch it while you can! 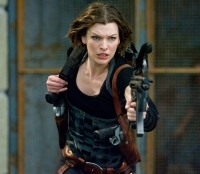 The wildly successful film franchise adaptation that has grossed nearly $700 million worldwide to the popular video game series, Resident Evil, returns in its highly anticipated fifth installment, RE5IDENT EVIL: RETRIBUTION in state-of-the art 3D. The Umbrella Corporation's deadly T-virus continues to ravage the Earth, transforming the global population into legions of the flesh-eating undead. The human race's last and only hope, Alice (Milla Jovovich), awakens in the heart of Umbrella's most clandestine operations facility and unveils more of her mysterious past as she delves further into the complex. Without a safe haven, Alice continues to hunt those responsible for the outbreak; it's a chase that takes her from Tokyo to New York, Washington, D.C. and Moscow, culminating in a mind-blowing revelation that will force her to rethink everything that she once thought to be true. Aided by newfound allies and familiar friends, Alice must fight to survive long enough to escape a hostile world on the brink of oblivion. The countdown has begun. Once again written and directed by Paul Anderson, Resident Evil: Retribution stars Milla Jovovich, Boris Kodjoe, Li Bingbing, Kevin Durand, Shawn Roberts, Michelle Rodriguez, Sienna Guillory, Johann Urb, and Colin Salmon. Look for it in theatres on September 14, 2012. I would like to buy something made my Sony please. Did you notice Michelle is back? Yeah she died in the 1st flick, but is back as a clone (or something suitably stupid) Seriously guys, they've gone straight downhill with each successive one, the last one's F/X wereon the level of a SyFy tv-movie for god's sake.